This Sunday! 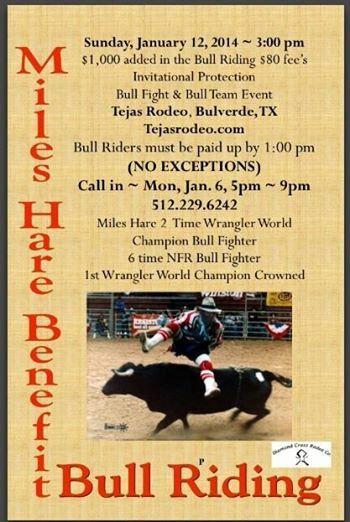 Miles Hare Benefit Bull Riding & Protection Bullfight Match! This coming weekend will be jam packed with exciting rodeo action! In addition to installment two of the the great Diamond Cross CPRA Winter Series rodeo on Saturday night-they will also be holding the Miles Hare Benefit Bull Riding, Cowboy Protection Bullfighting Match and Free Style Bullfights on Sunday afternoon at Tejas Rodeo in Bulverde, Texas. Miles has had a extremely difficult 2013. He contracted the West Nile Virus, had a Transient Ischemic Attack (TIA or mini-stroke) and also suffered a broken leg. The event this Sunday is to help him with the tremendous amount of medical bills and expenses that he has incurred. Please come join us as we all contribute to a helping out a legend in the rodeo business. Come out and meet the rodeo legends that are scheduled to appear! This entry was posted in Bull Riding, Tejas Rodeo, Uncategorized. Bookmark the permalink.